The Hopscotch Music Festival, returning to downtown Raleigh for a sixth year on Sept. 10-12, has announced its long-awaited lineup with nearly 140 bands and performers. Godspeed You! 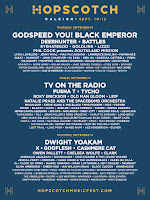 Black Emperor will take the City Plaza stage to kick things off with Deerhunter on Thursday, Sept. 10. 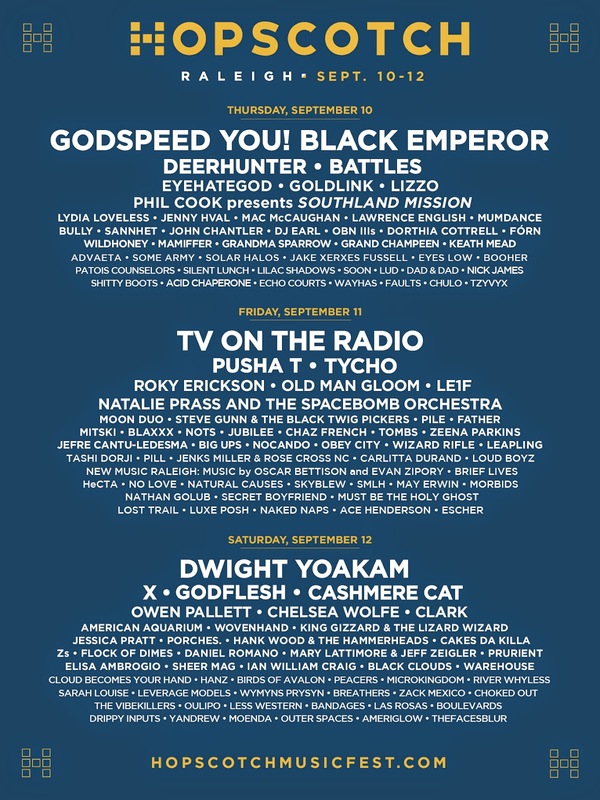 TV on the Radio, Tycho, and Carlitta Durand will follow suit on Friday, with Dwight Yoakam, X, American Aquarium, the The Vibekillers closing it down Saturday night. Owen Pallett will serve as this year's Improviser-in-Residence, headlining at Fletcher Opera Theater on Saturday and joining others for their performances on Thursday and Friday. VIP and three-day passed are currently on sale via etix. Single day and City Plaza tickets will go on sale next month once the festival schedule has been announced. Single day tickets will cost $85. City Plaza tickets are $40 for Thursday and Friday and $50 for Saturday.